Wed. Jan 10, 2018 5 P.M.
Forecast for 12 hours ending at 7 A.M. Saturday. Unfortunately for local snow fans, this is probably a little too optimistic for Louisville. Yesterday there was a very wide range of computer solutions for the storm late this week. Confidence is higher now as two changes have occurred in the past 24 hours. First, the various models have converged in their solutions. Second, the very unusual (and snowy) solution by the operational GFS has faded into a much more realistic-looking forecast today. In general, my current expectation goes like this: strengthening low pressure will develop over the northwest Gulf of Mexico and move northeastward tomorrow. It will accelerate quickly along the spine of the Appalachians tomorrow night. That storm track will be very important. A little farther west than expected and we’ll see almost all rain with just a little snow at the end. If the track moves a little east of current thought, we could be in for a heavy snow (5″-10″). The highest probability, though, would be for the storm to follow the current projected path OR to the left (west) of the current prediction. As usual, the NAM is a little more rambunctious with this system. It almost always is more energetic than the GFS 48 hours in advance, but the GFS is almost always better in the end. So, here’s what I expect – rain showers become likely by afternoon tomorrow. Rain continues tomorrow night and Friday morning. Temperatures turn colder by Friday afternoon and the rain changes to snow by mid-to-late afternoon. Temperatures will drop rapidly as the rain transitions to snow. A “flash freeze” of roads will be possible. Snow diminishes after midnight. Total snow accumulation for the Louisville area: 1″ – 3″ Less snow will fall east of Louisville. For instance, Lexington should see little more than flurries. Note: Very heavy snows are expected west and north of Louisville. A swath of snow should fall over western TN, western KY, southwest and central IN. 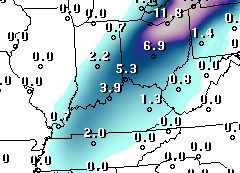 Paducah, Evansville, and Indy could get as much as 6″-12″ Friday afternoon and night. This entry was posted in forecast on January 10, 2018 by wx.